Click Here To See Astro City #14 Comic Book! Check out this very cool "SYMBOLIC" 1997 LARGE ART PAINTED cover by Award winning cover artist Alex Ross, from the story titled: "The Big Lockdown!" 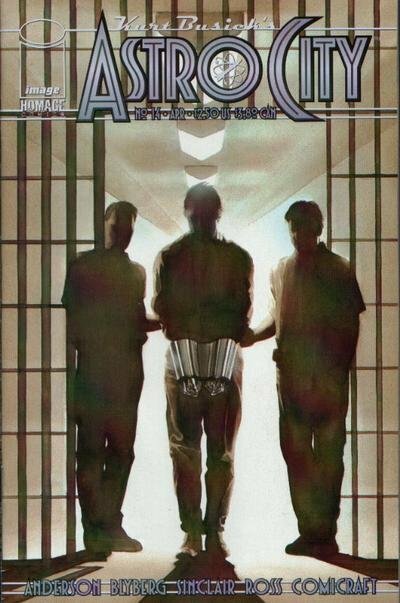 This nice cover features the VERY FIRST APPEARANCE OF STEELJACK, 1 of Astro City's main characters, as he is being led to prison with VERY large shackles on his arms! Alex Ross's amazing style clearly captures the somber tone of Steeljack's time in prison. Astro City Covers seldom hit the open market and here is your chance to own one. Actual cover art image measures 12.25 by 18.5 inches on a 13.75 by 20.25 inch art board! Cover is signed by the great Alex Ross also! Compare this nice cover art to the published comic book in the red link above, COOL!